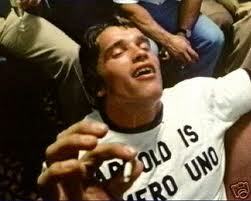 Before he was the Governator, he was having a toke. Even though the proven medical uses of marijuana have been well-known for decades, so much so that its use for medicinal purposes has been authorized in over a dozen states, it has curiously remained a Schedule I drug since 1970. It's not so curious, however, when you consider how many people are profiteering on the back of the never-ending War on Drugs. Just like prohibition, make something illegal and it opens up a career opportunity for people on both sides of the law. Chewing gum anyone? before it becomes illegal.